Walsall boss Dean Keates admits that this Saturday’s clash with the Cobblers is now ‘massive’ for him and his struggling team. After the Saddlers’ 1-0 defeat at Scunthorpe United on Saturday, they go into this weekend’s clash at the Bescot Stadium just two points above third-from-bottom Cobblers, and know they will be leapfrogged in the Sky Bet League One table by Dean Austin’s men if they lose. Walsall would still have the back-up of a game in hand on Town, which is at Bradford City next Tuesday night, but Keates wants his players to make sure they go out and get the job done this weekend. “Northampton is massive now,” said Keates. “We’ve got a week to get ready for it and, all being well, we can go and get three points. Former Saddlers and Peterborough United midfielder Keates has only been in charge at Walsall a little over a month, making the switch from being manager at Wrexham following the Saddlers’ decision to sack Jon Whitney. 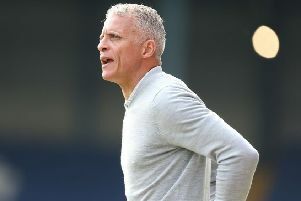 He has managed just one win in his six matches in charge, against rock-bottom Bury, and the loss at Scunthorpe was the fourth time he has tasted defeat in his short spell in the hot seat. But he is confident he and Walsall are going to have enough in the tank to avoid the drop, even though the Cobblers and Rochdale are now breathing down their necks. “The comfort we take is the fact it’s in our hands,” said Keates. “We can control it, but we’re running out of games and teams are picking up points.